Healthy Eating is a critically important and often underestimated factor in ensuring good health. The food we eat is becoming increasingly important in a time where our lifestyles are contributing to poor physical, mental, and emotional ill-health in addition to overweight and obesity, across all life stages. Early Year settings are a key environment for promoting healthy diet and facilitating healthy habits and behaviour change, and in addition to the impact that nutrition has on our health, there is a growing body of evidence that demonstrates it has a significant impact on behaviour, concentration, achievement. Children's diet can be an important influence on their health now and in the future. There are growing numbers of people affected by chronic diseases such as obesity, diabetes, high blood pressure and heart disease. A good diet in childhood can help to protect against chronic diseases like these in later life. Current statistics show that increasing numbers of children and young people are either overweight or obese. Most children in the UK eat too much fat, especially saturated fat, added sugars and salt. Children on average eat only 2 out of the recommended 5 portions of fruit and vegetables a day. Poorly nourished children, especially those who are overweight or obese, often experience social and psychological problems. This can clearly have a significant impact on behaviour and performance. Early Year Settings have an important part to play in developing a positive food culture in school- one where the healthier food choice becomes the 'norm' so that the healthier choice becomes the easier choice. The eatwell guide provides a breakdown of what we should be eating across the five main food groups to be sure we are eating a healthy, balanced diet. 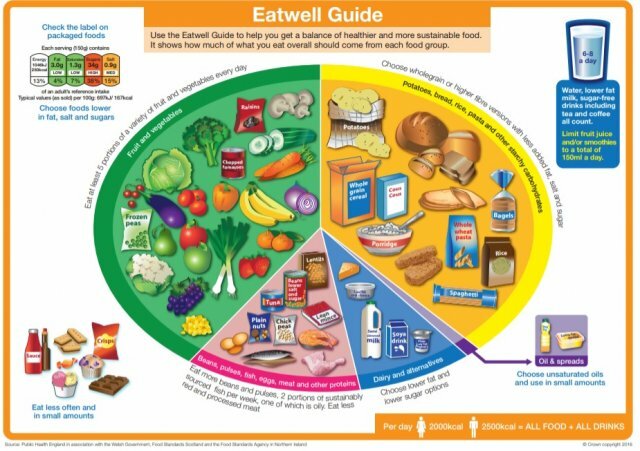 Find out more about how the eatwell guide works.